Whenever you’re delivering a presentation or running a meeting, one of your primary responsibilities is to facilitate the discussion that takes place during it. After all, if your meetings or presentations were simply about the delivery of information without discussion of it, an email will do the job. As we all know, sometimes that doesn’t happen. Which is why the message on this coffee mug resonates with everyone. 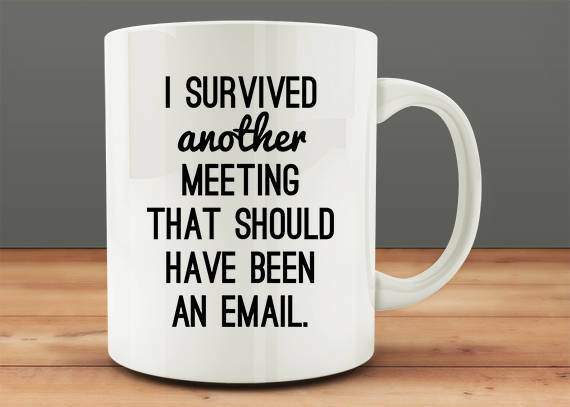 To avoid the “should have been an email” meeting, it’s your responsibility to make the conversation that takes place as fruitful as possible, relevant to all participants, and efficient. Let’s look at each of these responsibilities separately. First, a fruitful conversation accomplishes what it sets out to accomplish. Through the back and forth of the interaction, a problem may be solved, a project might move forward, or maybe important feedback is gathered and prioritized. Whatever the goal may be, you need the group’s help to achieve it. They need to be willing, focused, and engaged enough to participate. That means that the conversation itself must feel relevant to the people involved. When it does, participating in the conversation will feel like a necessary and important part of their jobs. Without this sense of relevance, participants will wonder why they need to be there and disengage. Finally, without efficiency, participants will feel that their time is being wasted. When this happens, frustration increases, willingness declines, and the work that needs to be done suffers. A fruitful meeting, then, requires engaged participants, and engaged participants need a sense of relevance and efficiency. Achieving that requires three things. Effective meetings and the presentations they involve need to be framed. The frame is communicated at the beginning of the presentation or meeting and is designed to promise relevance and efficiency. It brings people into the conversation. A strong frame does four things. Building a frame that answers these questions brings order to the conversation while placing it squarely within the context of the participant. Once the frame is laid out, everything that follows should fit within it. Download a free framing strategy worksheet to get your next meeting started. Reaching these goals can be a challenge because it requires (1) giving power over to the individuals in the group and (2) trusting that the conversation that takes place between you will help you achieve the goal you’ve set out to achieve. Sometimes encouraging the conversation can be frustrating because you feel it’s going on too long or that people are being stubborn. Do your best to put those feelings in check and trust the process to take you where you need to go. When it comes to controlling interactions effectively, the frame laid out at the beginning of your meeting is your ally. Use the frame to keep the conversation focused only on those issues that are part of it. This includes questions about the information covered in each agenda point, of course, but also comments that relate to the meeting’s current situation, your goal, and the benefits for the group. Both of these examples place the comments made within the frame, making it easier for everyone to follow the conversation. When facilitating your meetings, keep in mind that while a topic may be of interest to you, it may not be relevant to the conversation you’re having. Shortening those discussions will be counterintuitive, so always seek to balance the needs of the group and the goal of the meeting.